On the 19th August each year, we mark a day of hope. A day to reflect and honour our much loved babies. 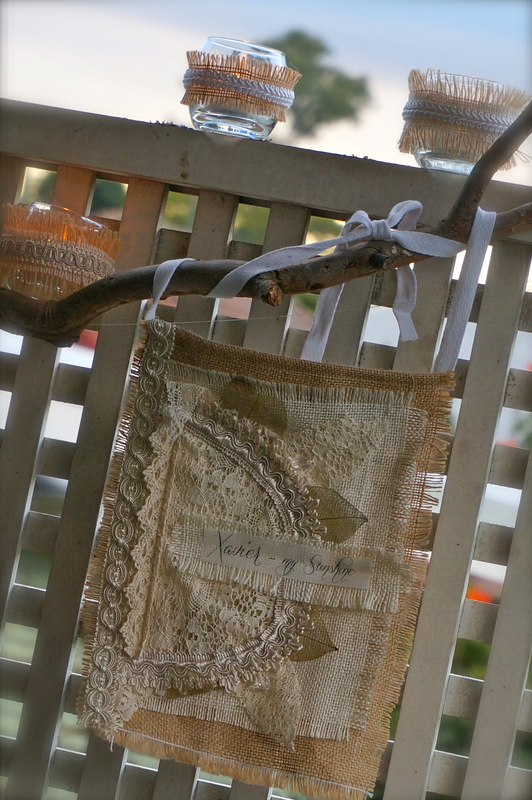 In the lead up to the day, Carly Marie hosts a prayer flag project. Parents and others touched by the loss of a child are invited to make prayer flags in honour of their child or children. The project had it’s birth not long after Xavier’s death. I remember so clearly sitting down and making him a flag, tears streaming, but grateful for something to do. For the first time, I found something healing to do with my empty hands. I could not stop making them. They hang on our verandah, joined by the flag I made last year and the one I have just made. As Xavier’s birthday is at the beginning of the project, each year I will make a flag for him, for hope and for healing. I am drawn to lace and fragility when I create for him. The flags reflect that. The ones I first made are a little battered and bruised – they are starting to fray. But I find them even more beautiful this way. I think it’s an apt metaphor for life after loss. I have a sewing machine and inclination to sew. But you do not need either to make a beautiful flag. Here are flags you might look to for inspiration. I wanted to make a flag with objects I had around the house. As this remains a bag, I have placed all of Xavier’s 2nd birthday cards within it. If you choose to make this flag, you might like to write a letter to your child and place it within the bag. Did you know that you can directly print onto fabric using freezer paper if you have an inkjet printer? Neither did I. This flag might suit those that prefer to design on-screen than on-fabric. If you feel uncomfortable printing like this, you could also use transfer paper and iron onto your flag. Create a design on your computer that you are happy with. It might include a photo, a verse or a beautiful picture. I chose to include Xavier’s footprint and a quote that speaks to me. Keep in mind the final flag will be 9inches (width) x 12inches (height) when creating your design. Using the A4 sheet of paper as a template, cut the freezer paper and the fabric. They should be the same size. Iron the freezer paper onto the fabric. This article gives more detailed instructions – please follow them – I would hate for anyone to damage their printer! Print onto the fused together freezer paper and fabric, ensuring that your print will be on the fabric side. Peel off the freezer paper. Trim or hem your fabric to size 9inches (width) x 12inches (height). If sewing, fold the top over with enough room to thread through a ribbon to hang your flag. If trimming, you might like to hang your flag with pegs. I chose to sew a heart around the image. It would also be sweet to add beads or other objects precious to you and your baby. I dearly hope your creative process brings you healing, hope and mostly, a sense of connection with your baby. 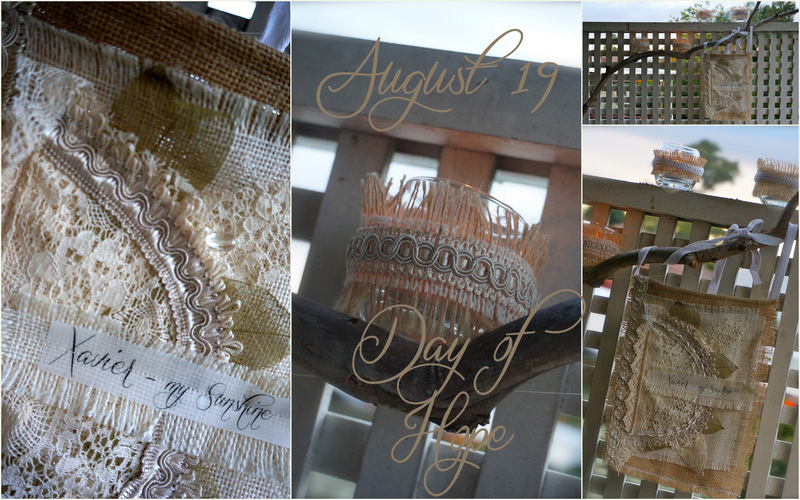 Today is August 19th – a day of Hope. A day to talk about children gone too soon, whether they lived outside the womb or only within it. A day to remember those with hearts of mothers, but have not yet been able to conceive. A day to shatter the silence that surrounds child loss and infertility and to remember all those little footprints that have left a large imprint on our hearts. Like many bereaved parents, I found my way to Carly Marie’s beautiful blog in the weeks following Xavier’s death. 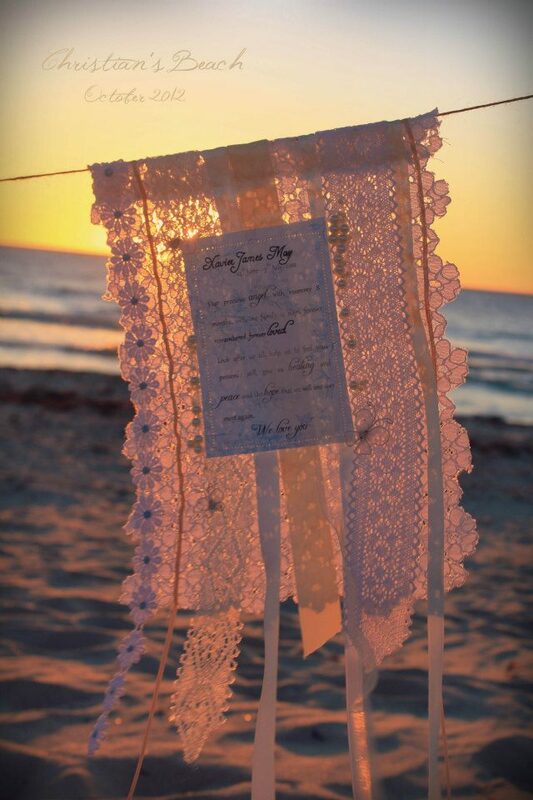 At the time (July 2012), Carly had just introduced her new project – an opportunity for the bereaved to make their babies prayer flags which would be strung and photographed on Christian’s beach. Being a crafty kind of person, this project seemed perfect. Making things for people is one of the ways that I show love and this seemed such a beautiful way to express my love for Xavier. As I selected lace and ribbon and beads, I felt moments of calm that had previously eluded me. When I sat making the flag up for darling boy, I felt closer her to him than I had in some time. I had thought that preparing his funeral service (which I did meticulously) would be the last public act I would be able to do for my son. To realise that I could create and share that creation with others was a joyful discovery. In the quiet moments I spent sewing, embroidering, planning I felt like I was nurturing my son – it was a feeling akin to the sleepy, beautiful bubble that surrounds nursing your child. It helped me realise that my need to mother was not extinguished when Xavier’s life was. That there were still ways to connect with him that did not centre around sadness. I made two flags initially – copies of each other – one to send to Carly and the other to hang in our home. Last year, I was lucky enough to meet the gorgeous Carly and she told me that Xavier’s flag was amongst the first she received. When she posted a picture of it, amongst others, as inspiration to others I was so happy – not just because I was beyond flattered that Carly thought it beautiful but that so many more people would see Xavier’s name. I was not ready to give up the healing that crafting the flags had given me, so I made several more, each with words that felt inspired by Xavier. Those flags now hang on our verandah, with fairy lights strung around them. I made Xavier another flag on his first birthday this year and strung more ribbons. I have made flags for close friends on special occasions – another way to share Xavier’s love with those around me. This year Carly is again hosting a Prayer Flag Project– this time each of us will photograph and share our flags to celebrate August 19th – Day of Hope. I decided to make a slightly different flag this time – my previous flags have all been ribbons, lace and ethereal beauty. This time I wanted to make something more earthy and representative of his presence on earth, rather than heaven. His sunshine is the most important symbol to us, so I chose to reflect that. Once again, creating for my son allowed me feel his presence and his peace. and lit the candles we gave out a Elijah’s mother blessing.